A crazed Qing Emperor suspects everyone around him of disloyalty, and when two well-respected advisors dare to suggest that maybe he shouldn’t have killed a bunch of innocent teachers and intellectuals, he decides to kill them, along with anyone else who might be disloyal. He tasks another advisor with developing a hit squad of a dozen assassins utilizing that advisor’s newly developed super-weapon, the flying guillotine, a combination of razor-sharp frisbee and basket on a chain that in trained hands can decapitate a person from 100 yards and occasionally, inexplicably, explode. Inevitably, certain members of the squad, though initially chosen for their martial arts skill and loyalty to the Emperor, begin to have second thoughts when they realize the nature of the people they’re assigned to brutally murder. This leads to the revolt and escape of the group’s most talented member, Ma Teng, played by Chen Kuan Tai (one of the villains in Crippled Avengers and one of the aged stars of Clement Cheng’s Gallants). The multi-year hunt for Ma, combined with the self-serving schemes of the most evil member of the squad (Ah Kun, played by Wai Wang), tears the group apart and eventually kills them all. The Emperor, of course, survives unscathed. Director Ho Meng Hua is one of the lesser-known Shaw Brothers directors, though he was one of their most prolific. He started there in the mid-50s, working in all kinds of genres before the kung fu boom of the late 60s and 70s. I’ve seen a few of his other movies (The Lady Hermit, Vengeance is a Golden Blade and Shaolin Handlock) and while they’re all fine, he hasn’t really stood out to me, this is easily the most creative visually (lots of Lo Wei-style overhead shots to go along with the expected excellence in action editing) and interesting politically. 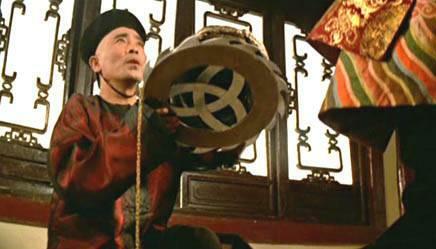 Lots of kung fu movies are set during the early years of the Qing dynasty, when the northern Manchu took over the country from the Ming Dynasty, leaving the nation’s dominant ethnic group, the Han, powerless for the first time in 2000 years or so (not counting the few hundred years of Mongol rule). The situation is ripe for allegorical interpretation. Whether you’re a Maoist celebrating the struggle against first the sclerotic Qing, then the invading Japanese and finally the Nationalist Kuomintang or an anti-communist refugee fled to British-ruled Hong Kong, you can see yourself on the side of right in the Ming-Qing battle. Even Chinese gangsters (triads) like to see themselves as descendants of the secret pro-Ming societies that fought the Qing (see Johnnie To’s Election for the triads’ view of themselves as historical actors). What we get with The Flying Guillotine comes at the tail end of the Cultural Revolution on mainland China, a decade of government-sponsered internal terrorism, with intellectuals, teachers, and just about anyone else being purged for lack of loyalty to the regime and/or ideological incorrectness. In the film, we see the inner-workings of an assassination squad, under the thumb of an Ivan the Terrible-like emperor and armed with an unstoppable weapon. Even under these circumstances, though, basic human decency shines through, as Ma Teng (and a couple other assassins) see the light and do their best to escape (the Emperor is far too powerful to actually be defeated). On the run, Ma starts a family and lives a noble, peaceful life as a farmer, his drive to quiet domesticity contrasted with Ah Kun’s deceitfulness and backstabbing ambition that leads to the disintegration of the hit squad. So, the film is therefore a neat allegory for the strife caused by the tyrannical PRC over the previous decade, with subjects encouraged to fight amongst themselves or simply hide-out, unable and unwilling to challenge the dominant power structure. Or, conversely, the life of a peasant farmer was idealized during the Cultural Revolution: those intellectuals who survived got themselves corrected by being sentenced to the country to work on collective farms. Thus, the film is about the struggle of the decent, communist farmer against the destructive ambitions unleashed by modern capitalism, with the Emperor standing in for the KMT’s dictator Chiang Kai-shek and Ah Kun, I don’t know, Nixon or somebody. Or maybe it’s about the revolution in general, about how radical revolutions always decay into petty in-fighting over ideological purity leading to mass execution as happened in Russia, China and France (“guillotine!”). Such are the perils of political allegory in Chinese film. It is, after all, a nation that allows Taiwan to be its own country as long as everyone pretends it’s actually part of China. Also, lots of people get their heads cut off. That flying guillotine really is a horrific sight, and Ho does well to match it with the sound of it spinning through the air, such that by the end of the film, all it takes is that distinctive whir to set us on edge, unconsciously shrink our heads into our shoulders and wish we had ourselves a steel umbrella.